I love breakfast foods. Growing up Sundays always meant a huge breakfast spread. My dad would wake up and fry the bacon and potatoes while my mom made waffles and eggs. I loved it! In college when I went home to visit my dad would still never let me touch the potatoes (apparently I've been told I'm too impatient and they don't brown properly) and my mom would still wake up to make fresh coffee. I cherish these memories of my parents and I still love breakfast foods in large part due to the great emotions they stir-up. Of all the breakfast foods waffles are my favorite. My husband prefers pancakes, but he is always out voted since my two boys love waffles as much as I do. This past week I was in a baking mood and hadn't made waffles in a few months, so out came the waffle maker and I made one of my favorite recipes for Buttermilk Waffles from Saveur magazine. This recipe has 8 ingredients. It takes 10 minutes of prep and cook time and makes 4 servings. Making only 4 servings of waffles would be no where near enough for my boys and I so I always double the recipe. One of the major changes I make to the original recipe is that I love to add mix-ins to my waffles. 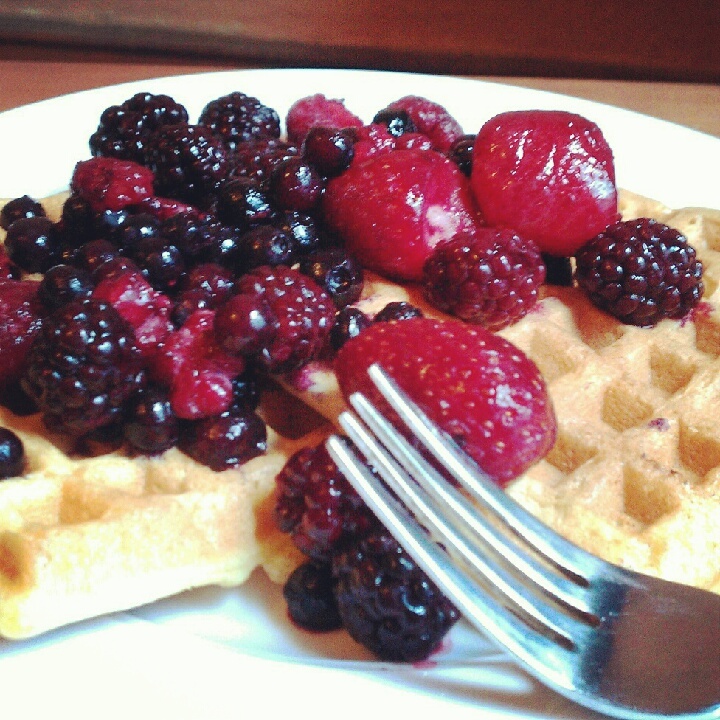 For my waffles I love fresh fruit, blueberries and raspberries. 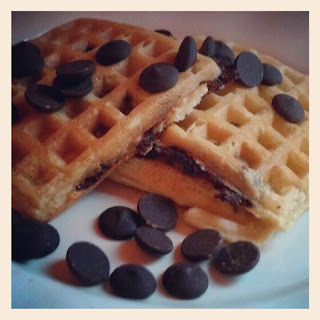 The waffles for my boys I add dark chocolate chips since they aren't overly sweet, but still have a great chocolate flavor. I also add approximately a teaspoon of vanilla to the batter, I feel that it makes the taste more rounded. Top with pure maple syrup and real butter and breakfast is served! My two boys love this recipe. They get very excited when I tell them that I am making waffles for their breakfast. Their favorite topping is fresh or frozen fruit, they love it! I like that the waffles always turn out light and fluffy and it works with a variety of mix-ins and toppings. These are definitely a stable for quick, easy breakfasts in my house! For the recipe go to Buttermilk Waffles. For my boyfriend's birthday, I plan on making waffles for him. I tend to put in pecans as well as pumpkin pie spices when we don't have any fresh fruit to put on it. He loves his with homemade jams and whipped cream. Thank you for sharing this! I never thought of adding stuff to the inside of waffles. Sounds so yummy! I love adding mix-ins, they really are delicious! Yum, I love waffles especially with fresh berries! I have just come across from Read, Wrie, Blog! and your site is fantastic! I love making food and baking, even more so now I have my boys. I think that cooking from scratch is getting a bit lost, and I really want to set a good example for my kids when it comes to making and enjoying food. But my confidence is lacking and I never know where to start. P.S. these waffles look de-lish! Just popping over from Naptime Review. I'm your latest follower. Nice blog. Thanks :) I followed you back, have a great week! Looks delicious and we always have a big homemade breakfast on Sunday's too! Thanks for sharing. Yum! I love waffles. These look so yummy. Thanks so much for sharing. Thanks :) Going over to follow you back!